67 Not Out: Can We Be In Two Places At Once? I've mentioned doppelgangers previously but people also talk about phantasms or bilocation and these often sound very similar. Doppelganger: A ghostly double of a living person, especially one that haunts its fleshly counterpart. Bilocation: Existence or the ability to exist simultaneously in two places. Phantasms are recorded throughout history. 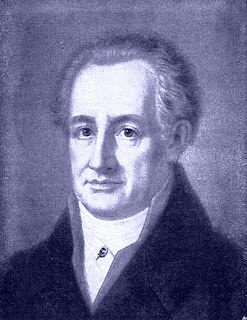 Goethe, for example, mentions this in his autobiography and gives instances where he experienced this himself. Goethe was riding alone after saying goodbye to his girlfriend, okay he actually called her a sweetheart as was done in those days. Anyway, there he was, on the road in Alsace when he saw 'with eyes of the spirit' his own apparition coming towards him wearing a gold and grey suit - very trendy at the time. Eight years later he was on his way to visit the same girl, obviously a steady sweetheart. He passed a certain spot on the same road and realised he was wearing a gold and grey suit. His conclusion was that eight years previously he had seen his future self. He defined the sighting as a mental image rather than anything real. So was this a doppelganger, phantasm or an instance of bilocation. I'd plump for phantasm - maybe a precognitive phantasm. Another strange case from the past was that of Emilee Sagee who was born in Dijon, France. She actually got the push from a job virtually every year for being in two places at once. In one instance, while a teacher at Neuwelcke, she was writing on the blackboard and her pupils were amazed to see that there were two Emilee Sagee's standing next to each other. On another occasion Emilee was in the garden and, as it was such a sunny day, her students asked if they could have the lessons outside. So off she went to get the headmistress's approval while the girls returned to their classroom. Suddenly the figure of Emily was seen sitting in the teacher's chair. Two of the children tried to touch her and one claimed to have walked right through her. They said that she felt like soft muslin. Needless to say, this unsettled the pupils and once again Ms. Sagee was out of a job. Phantasm, doppelganger or bilocation? Whatever, it shows that sometimes we may be able to wander off somewhere else, or even into the future, while remaining where we are. It's daydreaming taken to another level or maybe the astral body is just doing it's own thing. In Emilee Sagee's case these phantasms or doppelgangers happened while she was tired or absent minded and not when she was in robust health and absorbed with her duties. Over 80 years ago, scientists discovered that it is possible to be in two locations at the same time — at least for an atom or a subatomic particle, such as an electron. So why not us? Just love these kinds of stories. They're great fodder for fiction. Goethe was such an interesting man. I see things like this but only after i have been down the pub. Intersting blog.